On Tuesday, it was a student group’s mock presentation to help an Italian wine company strategize ways to increase brand awareness in Southern California. This weekend, students will travel to Northern California to work with Tesla's Business Planning and Global Sales division on a project. Still more opportunities for project experience await students who have the opportunity to travel to London, Paris, Germany, Cyprus as well as Chicago and to the University of Notre Dame. 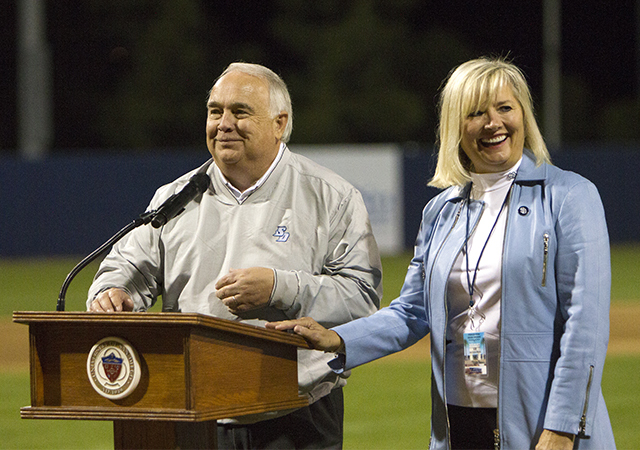 Everything there is what’s happening for at least 75 full-time members involved in USD’s Student International Business Council (SIBC). 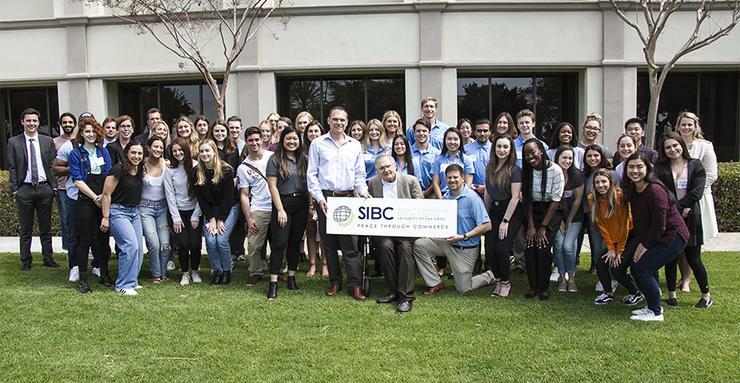 The SIBC at USD is the only privately-endowed student-run council on campus and is one of only three SIBC to exist on campuses nationally — Notre Dame and Kansas’ Benedictine College are the others. Open to all majors and first-year students to seniors with no experience necessary, the SIBC provides international and domestic real-world business experiences and the chance to make a difference in the world. The SIBC, which meets at 12:15 p.m. Tuesdays and Thursdays in Olin Hall 125 to discuss and work on projects and hear from guest speakers, had a few of its most important visitors on Tuesday. Following School of Business Dean Jaime Alonso Gomez’s welcome remarks, M&T Trust President Frank Potenziani, SIBC’s benefactor, and two others from M&T Trust, Frank’s son Greg Potenziani and James Brennis, were on campus to visit SIBC students and to listen to a presentation by the Italian Ziobaffa Organic Wine Project student group. The students’ task, “to identify and plan a regional distribution and market analysis to bring Ziobaffa wine to more Southern California retailers,” put nine students at the front of the room to provide their respective contributions — social media, website, direct-to-market, financial analysis and pinpoint ways to connect to a millennial audience — followed by questions and feedback from the M&T Trust members, SIBC advisor Brittany Catton Kirk and School of Business Clinical Professor of International Business Eileen Daspro, DBA, and other SIBC students. All feedback is helpful as the group moves closer to when some will travel to Lucca, Italy in July and to the Castellani Family Estates to make a formal presentation to USA Manager Director Luca Forte. This weekend, SIBC students will be in Fremont, Calif., to work with Tesla’s Business Planning and Global Sales, including analyst and USD alumnus Jordan Jadallah, on their project. The opportunity, created by SIBC Advisor and School of Business Associate Dean Stephen Conroy, allows students to take a deeper dive on questions posed in a non-disclosure agreement. Students will be at the South Bend, Indiana campus of Notre Dame, April 11-14 to participate in the annual Buy-Side Presentation event. USD, Notre Dame and Benedictine SIBCs give individual presentations on a particular subject as created by Frank Potenziani. This year’s topic seeks answers to questions such as “If you were the Chinese or US delegates to the China-U.S. trade negotiations what would you do differently? What are the ramifications of a failure and which currencies will be affected more? How would you do things differently? How do federal policies tie into this? How does Brexit fit in? Does it fit in? In addition to the three presentations, the SIBC school students will tour Notre Dame, SIBC council members from the three schools will connect and there will be a networking session with business leaders and SIBC alumni. • Olive Oil Competition Project with the Sisois Family Olive Grove in London. The presentation centers on the tax ramifications of having an international small business. Furthermore, Sisois Olive Oil seeks a digital marketing strategy, using a budget between $5,000-$10,000 and considering ROI on outlined customer acquisition costs. 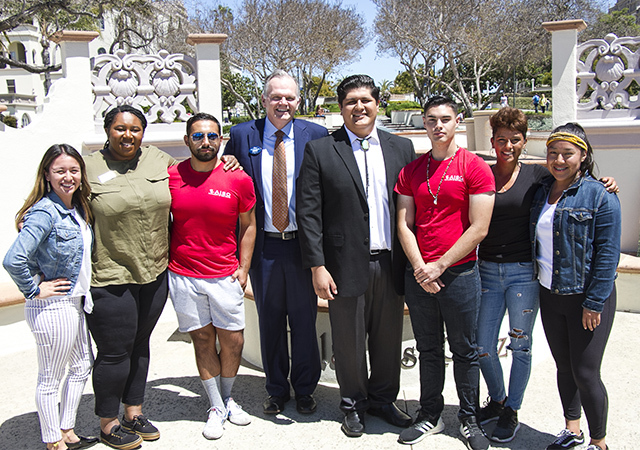 This project, the second one for the SIBC, connects USD students to USD alumnus Michael Sisois ’04. The student group will go to London April 12-14. • The Procat Artificial Intelligence Call Center Project will have students travelling to Germany, May 25-29. The project entails marketing and branding Procat International Ltd with Managing Director Philip Moran. Procat is implementing call center technology internationally using AI, speech recognition technologies and call center office space. The project was created by SIBC member Brittany Lang. • Two SIBC interns, Caroline Murray and Carolina Lemmen Meyer, worked with Orestis Michael, managing partner of Socialway eServices Ltd, last summer with sponsored airfare and lodging, in Cyprus, an island country in the Eastern Mediterranean. From an initial contact through SIBC member Sofia Panayides, the project to emerge is a Social eServices Industry Analysis Project that will take place in Fall 2019. The industry analysis consists of the competitive environment in a given industry in the home country or abroad. There will also be a comparative analysis of your firm’s product, services in a given market vis-à-vis top competitors, differentiation and positioning in a given market. • Kite Global Advisors are developing a communique to the G20 Summit in Osaka, Japan on how to unlock women’s leadership for climate solutions and drive greater gender equality by reducing the impact of climate change on women. SIBC students will work on researching different areas of general equality and climate change policies; formulating a communique based on findings for the June 28-29 G20 Summit in Osaka, Japan; and there is an opportunity for selected SIBC students to travel to Paris, France for the Women’s Forum Global Meeting November 20-22. • A Morningstar finance joint project between USD and Notre Dame SIBCs will be giving a presentation on April 12 in Chicago. Morningstar is a market leader in investment research. This project puts students through valuation methods in determining buy. Sell or hold guidance on a stock and will feature a blend of quantitative and qualitative analysis. The presentation in Chicago is intended for the education of students and simulates the work Morningstar would do in creating their equity research. 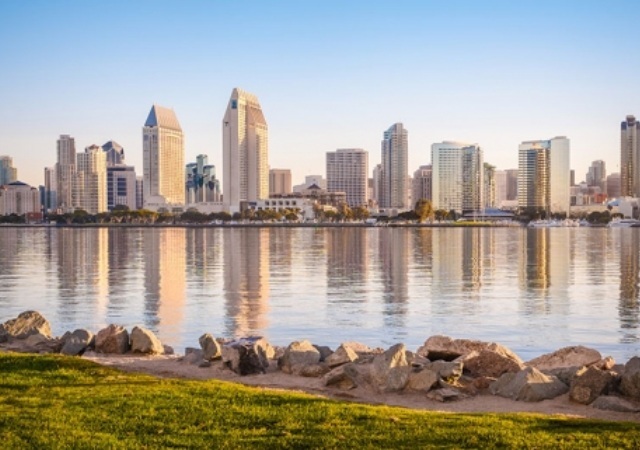 • TL Fab, a large structural steel and miscellaneous steel fabricator in Southern California, is looking to partner with an SIBC student team on a marketing plan for a new product. The group will help the company imagine its online presence, create physical marketing materials and identify target customers. The group’s project will culminate with a presentation in May to TL Fab President Dave Willson.